1. Disclaimer of Warranties; Customer’s Exclusive Remedy. The warranties herein are in lieu of all other warranties, express or implied, statutory or otherwise. SEM makes no other warranties either expressed or implied. In particular, SEM makes no warranty of merchant-ability or fitness for a particular purpose. SEM shall have no liability to customer for direct, consequential, or incidental damages of any kind whatsoever, including but not limited to personal injury, property damages, lost profits, or other economic injury due to an defect in the equipment, any use or inability to use the equipment, or any other breach by seller of this contract. SEM shall have no liability to customer in tort (including without limitation negligence) for any product liability concerning the equipment, or for the omission of any warning there from. The following remedy shall constitute the sole and exclusive remedies of customer under this contract and is expressly made in substitution of any and all other remedies. SEM warrants that the Equipment will be free of defects in workmanship and material (if properly installed, operated and maintained) for a period of one year subject to the limitations hereunder set forth. If within the one year warranty period, SEM receives from the Customer written notice of any alleged defects in the Equipment and if the Equipment is not found to be in conformity with this warranty (the Customer having provided SEM a reasonable opportunity to perform any appropriate tests thereon) SEM will, at its option, either repair the Equipment or supply a replacement therefore. 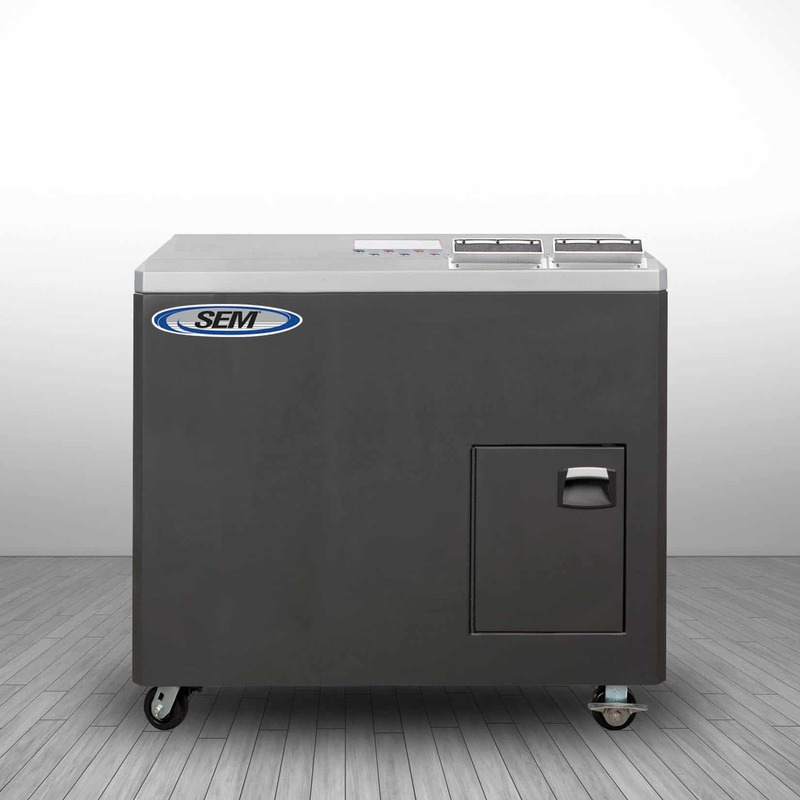 SEM under either option shall have the right to require Customer to deliver the Equipment to SEM’s designated service center and the Customer shall pay all charges for in-bound and out-bound transportation and for services of any kind, diagnostic or otherwise, excepting only the direct and actual costs of repairing or replacing the Equipment. If after reasonable effort SEM cannot correct said deficiencies, SEM will make an equitable price adjustment based on actual performance, provided that such adjustment shall under no circumstances exceed the purchase price. SEM further warrants that the parts and components supplied by SEM and forming a part of the Equipment will be free from defects in material and workmanship for a period of one from date of shipment to the Customer. SEM’s liability shall be solely limited to the supplying of replacement parts and materials. For purposes of these Terms, the Equipment will be deemed defective only if (i) the defect materially impairs the value of the Equipment to Customer, (ii) the Equipment was defective on the date of original shipment, and (iii) the Customer notifies SEM in writing of the claim within the warranty period. If the Customer requests and SEM agree to the performance of warranty work during any time other than SEM’s ordinary business hours and work periods, the Customer shall be required to pay for all premium time. If the Customer requests and SEM agree to the performance of warranty work, the Customer shall be required to pay for the travel time, living and travel expenses of any personnel of SEM required to perform such warranty work. Equipment sold but not manufactured by SEM will be warranted against defects in material and workmanship consistent with the warranty policy of the original manufacturer of the equipment. All warranties shall be null and void where the Equipment has been subjected to accident, altered, misused or abused, or Customer has failed to ensure proper permitting storage, installation, operation and/or maintenance of the Equipment. Use of the Equipment in improper or non-recommended applications (including operation above rated load capacity), or use of parts or components not meeting SEM’s specifications or quality standards (e.g., non-SEMs part or components) renders all warranties null and void. The foregoing warranties do not apply to any product or part thereof which has a life, under normal usage, shorter than the indicated warranty period such as, but not limited to, belts and bearings. All production figures, throughput rates, production rates, capacity figures and cost figures contained in SEM’s proposals, printed literature, advertising, drawings and/or quotes are based on tests SEM believes are reliable and on SEM’s understanding of the Customer’s project and are not warranted or otherwise guaranteed. If SEM provides Customer with assistance or advice concerning the Equipment or any parts/service supplied hereunder or any system or equipment in which any such part/service may be installed and which is not required pursuant hereto, the furnishing of such assistance or advice shall not subject Company to any liability, whether based in contract, warranty, tort (including negligence) or otherwise. Customer is solely responsible to obtain any permits required by Federal or State or other law and to comply with all applicable laws concerning the equipment or the use thereof. An extended warranty is available at the initial time of the machine purchase or within 90 days after the unit has shipped. An extended warranty extends both the parts and labor portion of the standard warranty. Please see individual product extended warranty for specific terms.